Twelve-year-old June Farrell spends the summer at her Vermont home getting used to the woman her mother is planning to marry and practicing her pie-baking skills, as she hopes to win the blue ribbon at the fair. 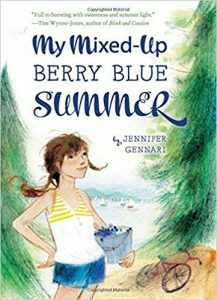 My mixed-up berry blue summer is an important book since it examines the issue of civil unions, an issue not often seen in children’s literature. The book explores June’s contradictory feelings and her resolve to speak out in defense of her family.